As with a lot of the early stuff I drew for the Jewels and Gemstones paper dolls, I really wasn’t thinking much about theme or long term plans, as much as I wanted to try to draw a variety of things. So, this outfit was born, because I didn’t have any fantasy clothing that didn’t involve a skirt at the time. I drew the Viking inspired outfit that I posted a few weeks ago after this one. I’m pretty sure I messed up the seam down the left leg, but I didn’t realize it until after I drew it. That’s okay. Every paper doll outfit is chance to improve my art, but I wanted to point it out. Occasionally I get an email about wanting to learn to draw and I think it is important to note that after drawing paper dolls for a long as I can remember, I am still learning constantly. I love any movie involving “swashbuckling.” So, the Three Musketeers, anything with pirates and such. I love a good sword fight in a movie and these sorts of outfits always feel kinda of… pseudo-pirate, but not really pirate to me. Around the Internet: If you haven’t ever checked out Armstreet, they are Euporean based company that makes historical and fantasy clothing. Never bought anything from them, but their website if full of lovely ideas. I’d like to thank all my Patrons who voted in my poll to help me prioritize my drawing. Thanks to them, we will be having Space Princesses! There will be Patron only posts chronically the designing and drawing of space princesses, so join us and you can see those too. Tomorrow, there will be the new 2019 paper doll collab! I’m super excited about this and there will be exclusive Patreon content with that, too! The Sprites Are Space Pirates! 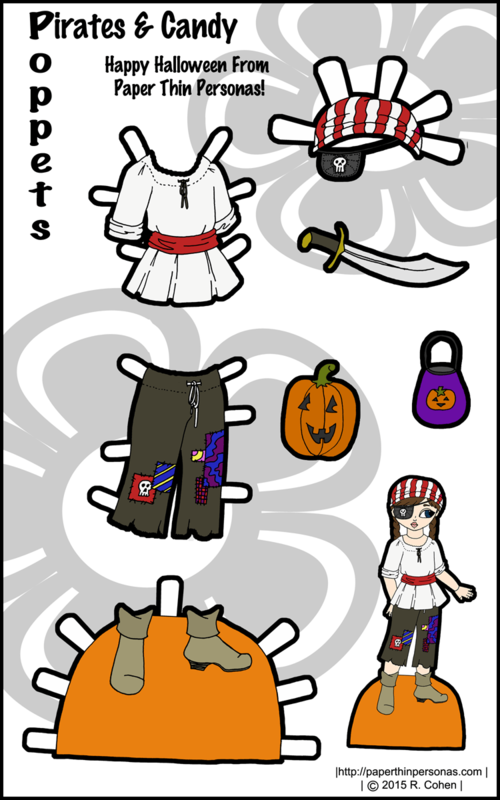 When I designed today’s Sprite paper doll outfits, I was thinking of Space Pirates. Why? Well, because sometimes I think about Space Pirates. I mean, doesn’t everyone? The thing is that I saw this image on Pinterest and I really liked her outfit and I thought, I should draw something inspired by that and then well… things went from there. I’ll be among the first to admit it is hard to image a world where hot-pants and thigh high boots are really practical spacewear, so they weren’t going to be space marines or something. Therefore, Space Pirates it was! Coloring this set was super hard, actually. 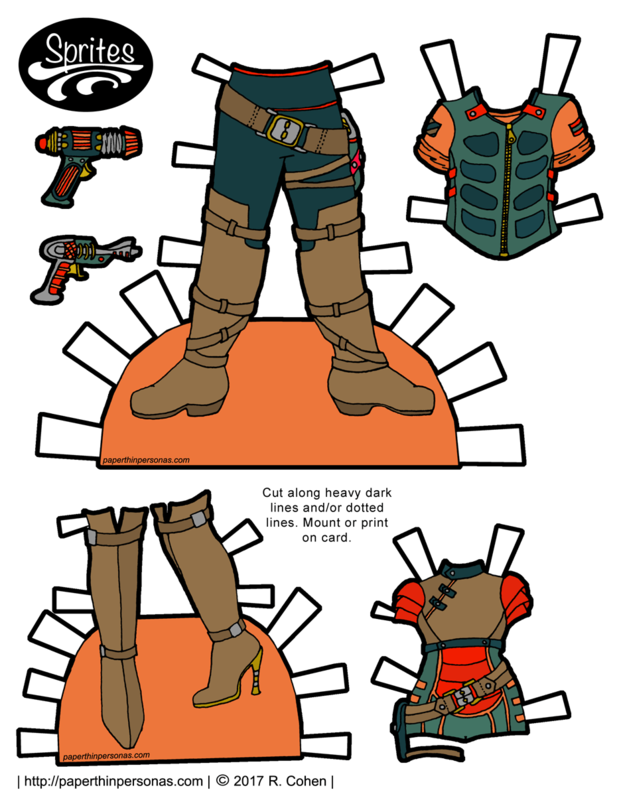 I initially had an all black thing planned, but as Boots remarked when she was talking about create her Star Wars paper doll of Kylo Ren, workimg in black can really obscure some of the details of the outfits. There’s a lot of detail here and I wanted to embrace it. As some of you may recall, in January, Boots, Julie and Myself started a collaborative paper doll project, all drawing clothing for a shared base doll. Missy joined us shortly there after and we have continued to create, each month, an outfit for our shared paper doll lady. For month four, our theme was Favorite Novels. For me, I knew immediately that Treasure Island was the novel I was going to work with. I fell in love with Treasure Island when I was a child. It has everything- a coming of age story, pirates, buried treasure and lots of adventure and betrayal. 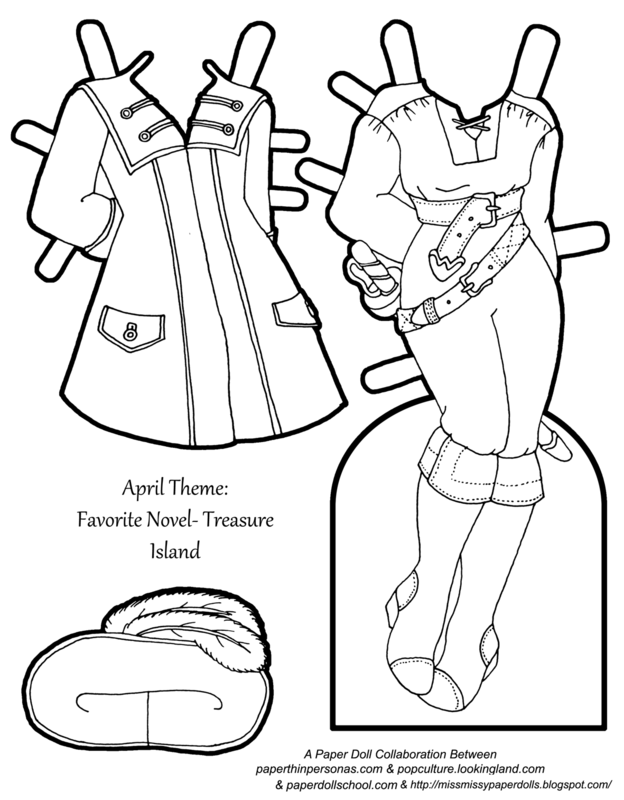 The lack of ladies in Treasure Island never bothered me, but since our paper doll is a lady, I created some fantastic pirate attire for her to wear. And there were plenty of lady pirates in the real world, though I doubt many of them wore things like this. Back when this whole year long collaboration project was proposed, I thought there was basically no chance it would survive four whole months. Call me a cynic, I suppose, but here we are in March of 2017 and there’s another batch of paper doll outfits on the horizon for my wonderful fellow paper doll creators- Boots, Julie and Missy. So, check out Popculture and Paper Dolls, Miss. Missy and Paper Doll School for three other literature inspired paper doll outfits. 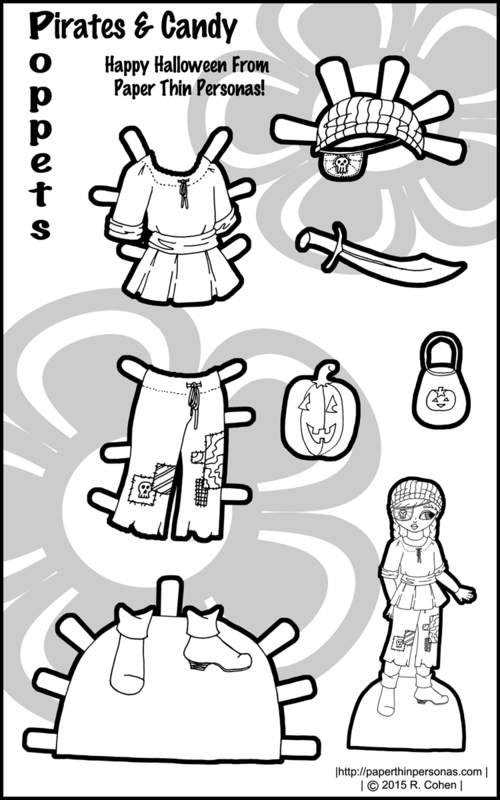 Last week I posted a fairy costume for the Poppet paper dolls. 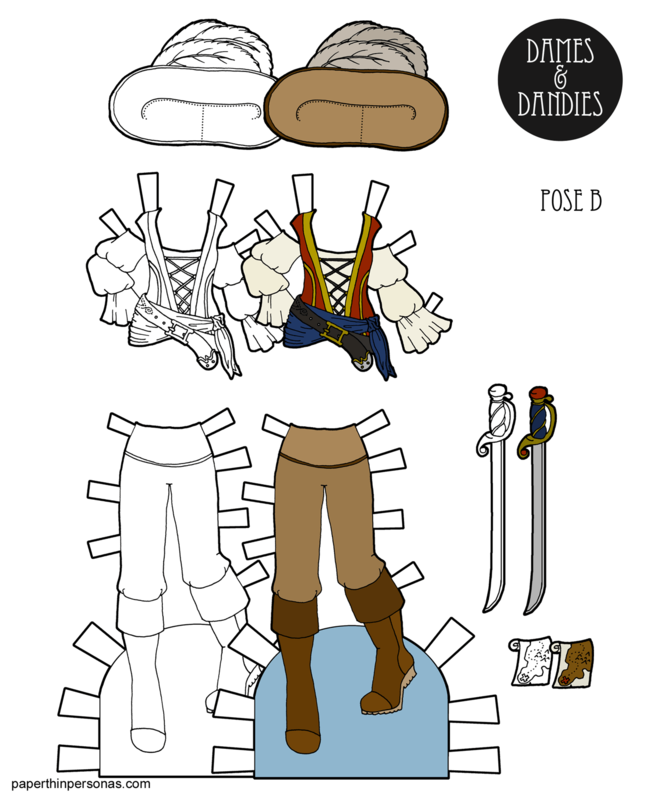 This week, we’ve got a pirate costume for the Poppet paper dolls. Some people had store bought costumes, but in my family that was strictly out. All of our costumes were always homemade. 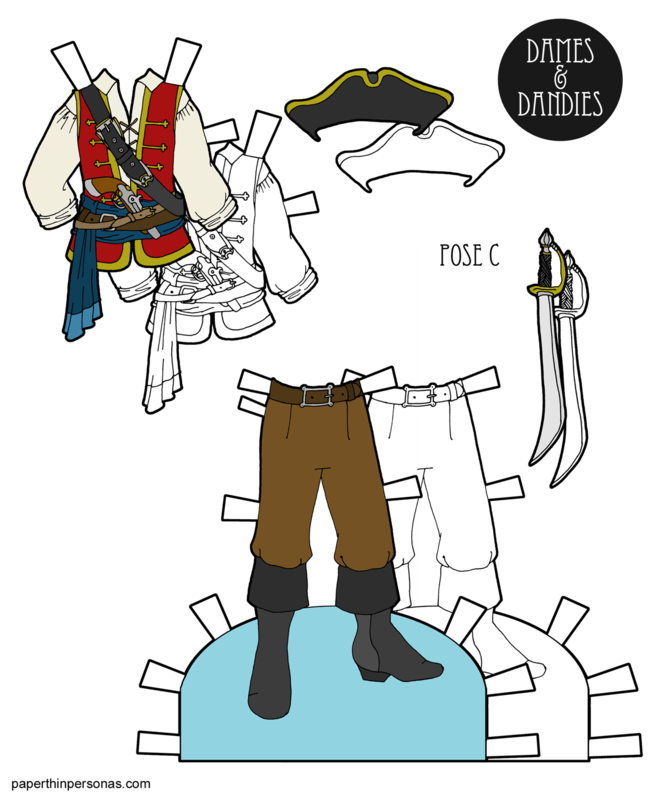 When I was designing this pirate costume for the Poppet paper dolls, I imagined a little girl getting one of her father’s shirts, perhaps and a scarf from her mother’s drawer and a pair of old pants that got cut off and patched and a plastic sword and getting to be a pirate. I have distinct and fond memories of brainstorming with my mother what I wanted to be for each Halloween. One year, my best friend went as a girl in a poodle skirt and I went as a poodle. Another year, I was a head of garlic. Yes, I wanted to be a head of garlic and bless my mother, she didn’t even blink. She came up with a way to use white garbage bags to make a head of garlic costume for her very odd first-grade daughter. It should come as no shock that I was an odd child. I imagine therefore that this costume is homemade. Pirates are always a fun easy homemade costume to go with. I hope everyone has a safe and happy Halloween on Saturday. Julie, Boots, and I will be sharing our Collaborative paper doll! I can’t wait for everyone to see her. She came out great.